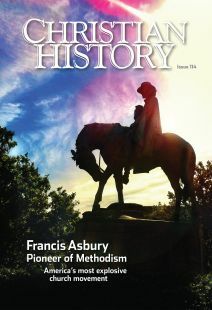 That tribute notwithstanding, Asbury felt lifelong frustration and disappointment with German revival leaders who refused to adopt a Methodist organizational style. Asbury’s remarkable success in organizing and deploying Methodists actually had two notable exceptions: Germans and African Americans. The latter eventually shook off white control, even the somewhat supportive control of Asbury (see “My chains fell off,” p. 21). And the former came equipped with their own leaders—and their own ways of doing things. Two centuries later, the heirs of those “twenty preachers” would join with Asbury’s spiritual descendants. But in the early 1800s, this growing German-language revival traced its beginning to a breaking down of church boundaries and organization. While senior pastor in a prominent German Reformed congregation in Baltimore, Otterbein got word that God was doing a new thing in the back country of Lancaster County, Pennsylvania. In 1767 he ventured to hear a Mennonite farmer named Martin Boehm (1725–1812; no relation to Asbury’s traveling companion Henry) speak of the profound breakthrough of Jesus Christ in his life. The educated pastor spontaneously embraced the rural preacher and exclaimed, “Wir sind Brüder” (We are brothers). There, in a Mennonite barn amid the plain people, America’s first homegrown denomination, the United Brethren in Christ (UBC) sprang forth. Its origin was an act of union between two opposites—Otterbein, ordained a state church pastor, and Boehm, heir to the state-persecuted radical Anabaptists. Here God was doing a new thing. Otterbein also came to recognize that God was doing something new among Asbury’s people, the flourishing Methodists. But his German flock cared little for Methodist order and discipline. And from his side, Asbury, though impressed with the single-minded Christly vision of the UBC, did not want to stretch his young movement too thin on the broad American landscape. It would have taken more German-speaking men than he had to join Otterbein’s group in ministering to the vast regions of Pennsylvania, Maryland, western New York, and western Virginia where there was a predominance of German settlers. Asbury thought German culture would soon assimilate into the English-speaking majority and become reachable by Asbury’s tireless English-speaking circuit riders. But the failure of the movements to join forces was somewhat surprising considering the long acquaintance of the two leaders. Asbury’s formative meetings with Otterbein occurred before Asbury became a bishop, but their friendship continued for almost 30 more years. When Asbury arrived in Baltimore in 1774, the German leader was already a mature, seasoned pastor with extensive theological education from Herborn University. He possessed a conscious awareness of the ecumenical dimensions of the church, rooted in his church’s Heidelberg Catechism (1563). And he had already emerged as the leader of the Pietist wing in the German Reformed Church in North America, a missionary effort of the Dutch Reformed Church in Amsterdam. Yet the seasoned German befriended the young Methodist itinerant on mission from Wesley in England and preaching the Arminian message of free grace (see “Asbury’s simple message,” p. 11). Otterbein had already publicly announced that he disagreed with Calvinists over predestination and church membership based on a doctrine of the elect, and that he wished to advance “in fellowship and brotherly love” with persons of all denominations, beginning with his own. Otterbein based this initiative on the Heidelberg Catechism, which declared that the Son of God, “through His Spirit and Word,” was gathering a community of persons from all times and places to confess the Lordship of Jesus Christ through the infilling of the Holy Spirit—apart from racial, ethnic, or linguistic differences. To that end, Otterbein gathered preachers among the German Reformed who agreed with him into the “Pipe Creek conferences,” so named for their location in rural Maryland. There they met for two years before the onset of the Revolutionary War in 1776. Otterbein intended to reach the lost for Christ by practicing the means of grace (various devotional practices including prayer, fasting, and Holy Communion), through catechesis (education of the faithful), and through voluntary prayer fellowships within his parish and beyond. Asbury was a lay Anglican preacher of the Methodist revival in England, unordained and forbidden by Anglican rules to administer the sacraments. He also had little entrée into the non-Anglo communities of the German migration to North America. But they differed in several significant ways. First, Asbury focused more on the immediacy of saving and sanctifying grace than did his German mentor. Otterbein believed that evidence of salvation in Christ shows in a life transformed by grace, but, unlike Asbury, he did not insist upon instantaneous conversion. By contrast, Otterbein long maintained spiritual fellowship with a group called “unpartisan” preachers, for their commitment not to be divided by any sectarian views. One day these preachers would serve as the nucleus of the denomination begun in that Mennonite barn in 1767, the United Brethren in Christ. Otterbein took this stance not out of a careless disregard of structures and ecclesial order, but because he distinguished between outer forms of religion and the heart of the matter. For him God’s mission was a greater and more compelling norm for evangelism than adherence to any form of church polity, including the Methodist plan of systematic conferencing. As floods of German-speaking immigrants settled across the frontiers of the middle colonies, Otterbein thought they were as sheep without a shepherd. The harvest was ready, and it was to be manifest despite European-devised categories of church life—Reformed, Lutheran, Catholic, Anglican, or Mennonite. Or even Methodist. Asbury, while a layman until 1774, harked back to Wesley’s Anglican structures of authority. Though an ordained minister and university graduate, Otterbein’s authority among his preachers could be traced not to his own German Reformed denomination, but to the marginalized in Isaac Long’s barn. He sought above all to identify with where God was at work on God’s terms. And what, after all, was God about? Perhaps more than Asbury thought. Work among the Germans did not die out, but grew among millions of immigrants to North America, across 35 states and 6 Canadian provinces, over the next two centuries. Germans became the largest ethnic group in North America, second only to immigrants from the British Isles, and the UBC was the ninth largest religious body in the United States by 1906. In 1946 the UBC united with the even more Germanic “Evangelical Association” founded by Jacob Albright (1759–1808). The resulting denomination, the Evangelical United Brethren (EUB), served as the conduit of a long line of witnesses to Christ running back to the great Pietists of Germany. In 1968, long after Asbury and Otterbein were dead, the heirs of Otterbein’s “twenty preachers“ actually did unite with the Methodists at last to form the United Methodist Church. At the time of their merger with Methodism, the EUB had 763,000 members in more than 4,000 US congregations, plus hundreds of mission congregations in Europe, Asia, Africa, and Latin America. Asbury bemoaned the fact that the “Otterbein folk” hesitated to embrace the Methodist plan; but their resistance was based on a view of Christian community that affirmed the “unpartisan” desire to operate “according to the will and mind of God, that the church of God may be built up, and sinners converted so that God in Christ may be honored.” Otterbein may well have commended to Asbury his statement that “whoever becomes free of sin and a party spirit has God to thank.” For Otterbein, to be free of sin was also to be “unpartisan,” free of party spirit, willing to have fellowship with all. J. Steven O’Malley is John T. Seamands Professor of Methodist and Holiness History at Asbury Theological Seminary and the author of Early German-American Evangelicalism and Pilgrimage of Faith: The Legacy of the Otterbeins.